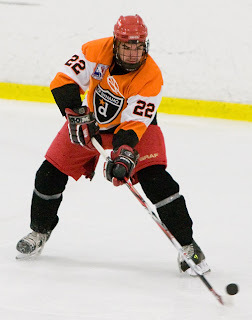 2009 NCAA Rookie of the Year Kieran Millan and incoming recruits Alex Chiasson (photo) and Wade Megan were selected on the second day of the NHL entry draft. Millan was the fifth round choice of the Colorado Avalanche. He joins teammates Kevin Shattenkirk and Colby Cohen and graduated senior Brandon Yip as Avs’ picks. The Alberta native, who was the MVP of the Hockey East playoffs, was the tenth goalie taken overall. Chiasson, who was picked early in the second round by Dallas, number 38 overall, had been ranked #34 among North American skaters. Dallas blogger Brandon Worley interviewed Chiasson following his selection. improved quite a bit under J.P. Parise in Des Moines, and its gone from a concern into a positive for him. He's good down low and makes good decisions. He'll go to Boston University and we are really excited about his potential." Megan, a 6-1 center coming off a 63 point season (27-36) for South Kent School, was taken in the fifth round by the Florida Panthers, #138 overall. ► 2009 Hobey Baker Award winner Matt Gilroy is one of five finalists named by ESPN for its Male College Athlete of the Year ESPY Award. To cast a vote, you must register at this ESPN site. GoTerriers.com coverage. ► Rumors persist that BU, along with BC, Providence and Vermont will be involved in the next Winter Classic that begins with a Bruins game at Fenway Park on January 1 and concludes with a college event a week later. ► David Quinn talked with NHL.com about his new position as head coach of the AHL Lake Erie Monsters. "I was absolutely ready to go back to BU," Quinn said. "The more success you are associated with, the more opportunity you get. If you told me a month ago I'd be head coach of the Lake Erie Monsters of the American Hockey League, I'd have told you you are crazy." ► Brian Strait, who recently signed a three-year deal with the Pittsburgh Penguins discussed his decision to leave BU with his hometown newspaper. Strait will head to Pens development camp in July and then reports for a rookie tournament in September. ► Grant Rollheiser was interviewed (audio clip) about his freshman season at BU by Shawn Mullin, radio voice of his former Junior A team, the Trail Smoke Eaters. 2009 recruit Alex Chiasson, ranked #34 among North American skaters by NHL Central Scouting, figures to be the first Terrier taken in this weekend's draft. NHL.com talked with the Quebec native about his career development and his reasons for choosing BU. "Alex shows a real strong competitiveness and willingness to go to the net. He takes the hit to make the play, yet at the same time can stickhandle in a telephone booth and find the open man. Night in, night out, he comes to play -- the effort is always there." Justin Courtnall, also a 2009 recruit, was a Tampa Bay draft pick in 2007. He’s expected to attend Lightning prospect camp, beginning July 8. A must-read account of BU’s eight-month trek to college hockey’s D1 National Championship is in the works. USCHO Senior Writer Scott Weighart, who has covered BU hockey for more than a decade, confirmed that he is in the process of writing an "authorized biography" of the Terriers' seven-championship season, culminating in their overtime win in the NCAA title game. As might be expected, the title will be Burn The Boats, while a subtitle has yet to be determined. For Weighart, who has five other books to his credit, this is his first sports book. It will feature a 16-page insert of photos and will be published by Mosaic Eye Publishing of Brookline, Mass. Burn The Boats will begin with BU's season-ending loss to Vermont in the 2007-08 Hockey East semifinals, and then will continue through the 45 games of this record-setting season. For his research, Weighart interviewed all six Terrier seniors as well as numerous underclassmen, including Brian Strait, Colin Wilson, Kieran Millan, Zach Cohen, Nick Bonino, Eric Gryba, and Colby Cohen among others. Jack Parker and assistants David Quinn and Mike Bavis also were interviewed for the project, as was the Voice of Terrier Hockey, Bernie Corbett. According to Weighart, the book will go into detail about many behind-the-scenes events. These include the near defections of Matt Gilroy and Colin Wilson to the professional ranks last summer as well as the "death-row reprieve" granted to two players who were nearly cut from the team last spring. Besides game action, he says readers will “get to know about the personalities in the team, life in the clubhouse, and many previously unrevealed turning points during the momentous season. "This project is a real labor of love," Weighart explained. "It was an amazing experience to follow the team this season, and I am very apreciative of the opportunity to write a permanent record of it all in the form of this book. I already have written about 20,000 words, and the story is up to the early Lowell game with the frenetic ending. “ I also have had to weave in quite a bit of description about Parker, the key players, and the locker room, so I believe that much of the most challenging writing is behind me,” he added. "That remains to be seen, though." Burn The Boats will be published before next season begins. We’ll post further details, including how to obtain it, later this summer. Associate Head Coach David Quinn is leaving BU to become head coach of the Lake Erie Monsters, the AHL affiliate of the Colorado Avalanche. He succeeds former Terrier Joe Sacco who was elevated to the Av's head coaching postion earlier this month. Quinn and Sacco were teammates for one season at BU. 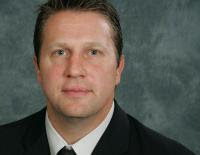 Quinn, who spent the past five seasons as Jack Parker's top assistant, previously was a head coach in USA Hockey's NTDP program and was an assistant at Nebraska-Omaha. His name had been mentioned recently when UNO filled its vacant head coaching position. recruiting, and he did a terrific job coaching our team. It will be a big hole for us to plug. We’re starting to think about the candidates, and we’re going to have a lot of candidates, obviously. We’ll have to sift through it and make some decisions in the next couple of weeks. The DFP article added that "Current BU assistant coach Mike Bavis is expected to be promoted to associate head coach, and a new assistant is likely to be hired in the next week or two." The Sports Museum at the TD Banknorth Garden has selected Terrier Head Coach Jack Parker as one of the 2009 inductees to its Hall of Fame. Parker, entering his 37th season behind the BU bench, will be honored along with longtime friend and rival, BC Head Coach Jerry York. Details about the June 24 event are in a BU Today article and, if interested in attending, click on this E-vite from the Sports Museum. Sophomores Vinny Saponari and David Warsofsky are among 43 players invited to US Junior National Team Evaluation Camp. 2009-10 Terrier captain Kevin Shattenkirk and Colin Wilson were members of last year’s Junior National Team that finished fifth in the World Junior Championships. A match-up of college hockey powers that many hockey fans had anticipated in the 2009 NCAAs—but never materialized—will take place next season at Agganis Arena. According to Notre Dame’s posted schedule, the Fighting Irish, who finished second to the Terriers in the national polls but lost in the NCAA regionals, will play BU on Tuesday, Oct. 20. BU and Notre Dame have met only twice previously, both times in holiday tournaments. En route to the program's first NCAA title in 1970-71, the Terriers beat the Irish, 7-3 in the Boston Arena Christmas Tournament. In 1995-96, the teams clashed in the Badger Showcase, with BU winning, again 7-3 . With BU's magical 2008-09 championship season — and its "UNBELIEVEABLE" (thank you, Gary Thorne) finish — now in the rearview mirror, Terrier Head Coach Jack Parker has provided his responses to your questions in our third and final Coach's Mailbag of the season. Thanks to all who submitted questions. Q—Two months have passed since BU won the national championship. During the regular season, the team frequently won with ease, but never won a game in overtime. Only twice did the team fall behind by two goals, then come back to win or tie. But in neither case was BU down two in the final minutes. With all the one-goal post-season wins, and so many of them comeback wins, what does this say about the character of the 2008-09 team? JP—I’d say two things: First we were not playing our best hockey and we were getting the opponents’ best game. Secondly, and most importantly, we had the talent and leadership to "find a way" to get it done. Q—Besides the final minutes of regulation and the overtime against Miami, what moments and achievements from this season stand out for you? ►the almost-perfect game we played against UNH at Agganis Arena in mid-January. Q—Do you expect the team's upcoming White House visit will be a bigger thrill than firing a pitch from the Fenway mound? JP—Absolutely. I would be ecstatic to shake hands with President Obama, a president I respect and admire. Q—In last September’s mailbag, you discussed the need for a “new formula” to prepare the team for a faster start and noted that previously you had “broken the team down and then built them up again.” The team’s 6-1-0 start shows that your new approach worked. So, what was done differently? JP—We started with a different approach to "Team Building". In the past we would do outside activities such as Outward Bound course on a Boston Harbor Island or Trust exercises and rope courses, etc. with outside instructors. This year we had former great BU Hockey players talk to our team and discuss what it should mean to be a "BU Hockey Player." As coaches, we tried to be more positive in our approach with the team and with individuals, and we also let the seniors "own" the team more. Q—Can you spell out those qualities that make someone a "BU player"? Q—How might you alter that “new formula” for a team coming off an NCAA championship? JP—We are currently planning our approach for this season. It will retain some elements, but there also will be a different focus because our team and situation is different. Q—You also spoke last September about changing the team’s mindset to perform better at home. The 10-7 home record in 07-08 was improved to 16-4-2 in 08-09. Was the improvement due to mindset, talent or both? JP—Both for sure. We were more experienced and talented and we were determined to get off to a good start. Since we had a number of home games early, it translated into home wins. However, we were fabulous on the road all year (Kieran Millan did not lose a road game all year) and that was a huge factor in our confidence level. Q—With so many lineup slots to fill due to graduations and Wilson’s departure, do you expect next season’s freshman class to have as big an impact—outside of goalie—as this past season’s rookies? JP—I hope so. With the loss of Strait just recently, we will have two freshmen defensemen in the class and both will have the opportunity to log significant minutes. Up front, we lose five of our top six forwards and we are only bringing in three at present. So the returning players discussed in the following question will have step up as well. The younger players will be “thrown to the wolves” a little bit earlier than last years’ pups needed to be. Q—The depth of last year’s team limited the playing time of several younger players and Ryan Ruikka was injured much of the year. Which of these players do you think will step up and challenge for regular lineup spots? JP—I think all of the players who did not get a lot of ice time last season were capable enough to play regularly. Other guys just played harder or were more productive. The question is who will be next years' Zach Cohen and the answer is any one of them. Someone will produce the effort and focus necessary to be a "BU Hockey Player." Q—Has winning the 2009 National Championship impacted your recruiting efforts yet and do you expect it to be a factor moving forward? JP—It certainly will be a factor in the future. Our classes for Sept '09 and Sept '10 were already somewhat locked up, so not much immediate impact. Q—Is recruiting for 2009-10 complete or are there more slots to fill? JP—Everyone is set for this September. JP—Well for starters Co-Captain Brian Strait has signed a pro contract with the Pittsburgh Penguins. Therefore, we have an adjusted leadership situation. Kevin Shattenkirk will be the Captain and we have appointed Nick Bonino and Eric Gryba as assistant captains. All three of these players will be good leaders and teammates, but it remains to be seen if they and the other upper classmen can approach the bar set by the outgoing captains and seniors. Q—There was plenty of competition for most improved player on this year’s team. What do you think were the keys to Zach Cohen's dramatic improvement this year? JP—Effort and focus. Simple but not easy. Q—What is your assessment of the first season with 2 referees and 2 linesmen? Is there any particular rule change you would like to see down the road? Q—This past season, I noticed that penalties were called by a referee who was far removed from the play, even though another referee was just a few feet away from the action. Is the thinking that the referee further away from the action has a better perspective than the ref who's on top of the play? Q—Do you anticipate returning to a goalie rotation for 09-10? JP—I hope so. We have plenty of skill and depth there; hopefully we can take advantage of that. Q—You are always quick to recognize the contributions of your assistant coaches? What are the individual strengths of your assistants that make them so valuable to the coaching staff? JP—First and foremost, they are good recruiters. They both (Bavis & Quinn) are good evaluators of talent and very dedicated to outworking the competition. All three are excellent on ice coaches as well, so our players get plenty of individual attention. And possibly their best contribution comes when they are pushing me to be more focused or getting me to change my approach to team or individual interaction. Q—What does it take for a player to earn a paw sticker for his helmet? Is it different for forwards, defensemen, and goalies? JP—Goalies only get paws for shutouts. Everyone else earns paws for things that don't ordinarily get recognized such as blocked shots, great defensive plays, assists on shorthanded goals and one paw for the best "Hit of the night." BU Sports Information has created the first of three computer desktop wallpaper designs to mark the Terriers fifth NCAA Ice Hockey Championship. This one features the team photo taken moments after BU's overtime win over Miami in the title game, along with three individual winners of national awards: Coach Jack Parker (Spencer Penrose-Coach of the Year); Matt Gilroy (Hobey Baker Award) and Kieran Milan (Rookie of the Year). You can download it from this link. Two additional designs are planned for later this summer. NOTE: Check back soon for Coach Parker's responses to the final Coach's Mailbag of the season. Two former Terriers celebrated Cup wins over the weekend. We’ll start with Chris Bourque (right) of the Hershey Bears who clinched the AHL’s Calder Cup with a 4-1 win Friday night over the Manitoba Moose in game six of their playoff series. Bourque, who had 73 points during the regular season, assisted on the Bears’ first goal and then scored the game-winner, beating former BC goalie Cory Schneider with a one-timed blast. Bourque, who was named the game’s number one star, finished with 21 (5-16) post-season points, fifth best in the AHL this season. John Curry’s name won’t go on the Stanely Cup as he played in only three regular season games for the NHL champion Penguins and saw no playoff action following his call-up from WilkesBarre/Scranton. But the former All-American goalie and 2007 Hockey East Player of the Year was on hand and in uniform when Pittsburgh won game seven of the Stanley Cup final on Friday. Curry celebrated on the ice with Penguins. Last week, we reported on Brian Strait’s decision to forego his senior year and sign a three-year contract with the Pittsburgh Penguins. That is confirmed in Scott Weighart’s news story today on USCHO. His spot on the roster will be taken by 6’0”, 187lb. left-shot defenseman Sean Escobedo. At the time of his verbal last summer, USHR reported "Escobedo is scheduled to arrive on Comm. Ave. in the fall of ’10, but if the Terriers lose someone earlier he could be there in the fall of ’09." Which is how things have now played out. Escobedo, who was ranked #154 among North American skaters for this months NHL entry draft, spent last season in the USHL, playing for Tri-City and Sioux Falls scoring 17 assists in 59 games. Previously he played in the EJHL for Apple Core and was named to the league all-star game. Coach Jack Parker said “Escobedo is the same type of player (as Strait). He’s not an offensive, get-up-the-ice type player like Shattenkirk or David Warsofksy, but he won’t have experience at this level.” He also discussed Strait’s departure in the USCHO article. A native of Long Island, New York, Escobedo played in the recent Predraft Showcase where USCHO photographer Melissa Wade took this photo. Four members of the 2008-09 Terriers were named to the Hockey East All Academic Team: John McCarthy (third time), Jason Lawrence, Joe Pereira and Ryan Ruikka. Ruikka also earned a spot on the league’s Academic All-Star Team. Zach Cohen’s breakout season earned the Illinois native an invitation to the Chicago Blackhawks development camp this summer. We'll report on other Terriers headed to NHL development camps as the information becomes available. Blog contributor Sean Pickett has updated his listing of points scored by Terrier skaters during the first two seasons of their (varsity) careers. Colin Wilson with 90 points is 23rd and Nick Bonino’s 79 points is 37th. Stats for more than 400 players are on the list. Former Terrier standout forward Joe Sacco was named head coach of the Colorado Avalanche on Thursday, replacing Tony Granato. The Avs recently shook up their front office, firing both the general manager and Granato. The Medford, Mass., native who scored 128 points (63-65) in three seasons for BU, spent the past four seasons coaching in the Avs organization, the last two as head coach of the team’s AHL affiliate, the Lake Erie Loch Monsters. A fourth-round Toronto draft choice in 1987, Sacco played 738 games in 13 NHL seasons. Three members of the 2008-09 Terriers are Avalanche draft choices: Brandon Yip, who graduated last month, Kevin Shattenkirk, who will captain BU next season, and Colby Cohen, who scored the game-winning goal in the NCAA championship game in April. Sacco is the third former Terrier to lead an NHL team. Steve Stirling, captain of the 1971 NCAA championship team and a first-team All-American, coached the Islanders in 2003-2004 and 2005-2006. Mike Sullivan, captain of the 1989-90 team and Sacco’s teammate for three seasons, coached the Bruins, also in 2003-2004 and 2005-2006. Jack Kelley, an All East defenseman and Terrier MVP in the early 50s and for ten seasons BU's head coach, was the first head coach of the WHA's New England Whalers, winners of the league's first Avco Cup championship. Sullivan’s name has been in the news lately, too. He spent last season as associate coach of the Tampa Bay Lightning but his contract is up at the end of this month. Sullivan has been given permission to talk with other teams and is rumored to be considering reuniting with John Tortorella, the Rangers’ head coach and Sullivan's one-time boss in Tampa. If he moves to Broadway, Sullivan will join two other former BU captains, Chris Drury and Matt Gilroy. Sacco's appointment prompted College Hockey News' Adam Wodon to do some summertime conjecturing about the candidates to succeed Jack Parker behnid the BU bench whenever the 2009 Spencer Penrose Award winner decides to step down. Defenseman Brian Strait, who had been named co-captain of the 2009-10 Terriers, will forgo his senior year and has signed a three-year contract with the Pittsburgh Penguins. 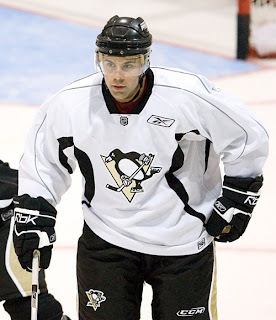 Strait, who was the Pens third-round draft choice in 2006 and is one of the most highly regarded prospects in their organization, took more than a month to make the difficult choice between a fourth year on the Terrier blueline and moving to the next level. Pittsburgh executives strongly felt it was time for Strait to join the pro ranks. While expected to spend next season with the Pen’s AHL team in WilkesBarre/Scranton, Strait will attend the NHL team’s training camp and have an opportunity to make the big club. We’ll update this post when the Penguins officially announce the signing. Strait’s departure along with Matt Gilroy’s graduation means that BU’s top defensive pairing from last season must be replaced. Highly regarded right-shot defenseman Max Nicastro, a third-round Detroit pick in the 2008 NHL draft is expected to claim one spot. The newest member of the recruit class is Ben Rosen, a 5-11, 175 lb. left-shot defenseman from the South Shore Kings. Rosen, a 1989 birthdate, was the top-scoring defenseman in the EJHL last season with a 10-42-52 line in 45 games, earning a spot in the league's all-star game. In his first season with the Kings (07-08) he was a teammate of BU's Kevin Gilroy and scored 31 points. The previous year he was with Des Moines/USHL where for part of the season, he was a teammate of Ryan Ruikka. Rosen had originally been headed to Brown where his brother Dan is a goalie. He reportedly decommitted a few months ago and now has signed on with the Terriers. From a St. Louis Blues fan site, we have a scouting report on another 2009 recruit, right wing Alex Chiasson , who was #34 among North American skaters in the final Central Scouting rankings. puck protection power forward, but ended the season with a distinct physical presence ... drives the net off the half boards or from behind the net ... able to shield the puck with stick-handling prowess, long reach, positioning, and sheer effort of fighting through checks and sticks ... does need more acceleration with the puck for better separation in tight places to ensure success at higher levels ... confident stickhandler who is patient with the puck and can handle it across his body well ... has a hard wrist shot and a heavy slapshot ... makes crisp, accurate passes and is dangerous along the half boards and end boards with centering passes ... is effective on the power play ... additional lower body strength will give him the power and low center of gravity to become almost unstoppable ... committed to Boston University for 2009-10 season. If Strait plays for Wilkes Barre/Scranton next season, he may find a familiar face there. Bryan Ewing, who was rookie of the year and a first team all-star, for Pittsburgh’s ECHL affiliate, the Wheeling Nailers. His play earned him a call-up to the AHL club and he should get a chance to move up next season. New England Hockey Journal looks back at Ewing’s first season as a pro. John Curry, the Baby Pens goalie for the past two seasons, is expected to compete for the backup goalie job on the NHL level. Hockey season has just begun in the Australian Ice Hockey League, where a pair of ex-Terriers have relocated. Eric Thomassian and Craig Sanders are currently the top scorers for the Canberra Knights and accounted for all the goals in a recent 3-1 win over the Sydney Ice Dogs. Last September, we posted about 1994-95 Terrier MVP Steve Thornton becoming player-coach of the Coors Belfast Giants of the British Elite League. After a successful season behind the bench, and on the ice (17-48-65), including success in the 2009 Challenge Cup, Thornton will return for a second season as coach. Once again, he’ll have ex-Terrier Shane Johnson as his assistant and mainstay on defense. Johnson, who like Thornon played for BU’s 1995 National Champs, will begin his ninth season in Belfast.